Spy shots and official video from McLaren show that the next supercar from the company, the P1, is well on its way towards production readiness. The McLaren P1 was first unveiled as a design concept at the Paris Motor Show in September 2012 and has been a subject of interest since. Expected to be the company's second production supercar, the P1 prototypes are currently codenamed "XP" by the company. The car has been captured on the race track undergoing trials, which McLaren has been conducting nearly 24/7 for several days, with spyshots and an official video. The race-inspired camouflage on the machines is a great touch. Like the concept prototype shown in Paris, the physical prototype being test on the track promises some powerful design cues and strong, Formula One-inspired performance. The HD video below also includes some beautiful captures of the exhaust note for this powerhouse of a machine. McLaren says they're testing the car in this camo around the globe, so there is a chance that anyone could see one of these on the road at any time. The company's engineers are testing the vehicle in various conditions and under differing climates and stress loads to be sure the exclusive supercar will be ready for anything when it goes to production. Bespoke components and developments for the P1 come from partner companies like Pirelli, Mobil 1, and others. Details of the performance values for the car have not been released, but it's sure to beat the current 12C - tops as that car is - and put many other high performance vehicles in its dust. 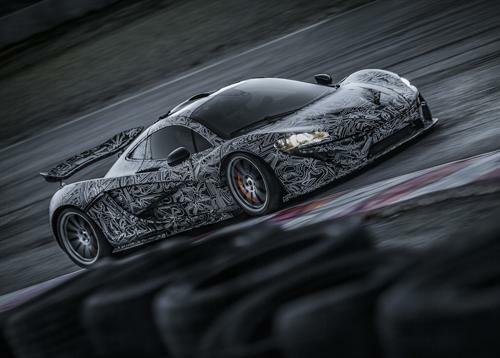 The McLaren P1 will make its next public appearance soon, promises the company.